Sorry, I have not been able to comment on the trash hauling thread but I have been out of town for the past week. So, please let me offer my perspective on the issue and perhaps clear up some questions that have been raised. Currently, Altadena operates under an open market system. That means there is no County control or oversight over who offers hauling services, what those services are, how they operate or how they are priced. Thus anyone who wants to be in the business can collect your trash. This can range from the major haulers like Allied and Athens to some guy with a pickup truck. Currently there are around seven haulers in Altadena, including a guy with a pickup truck. These haulers offer a variety of services and charge what the market will bear. There is not adequate control of such things as collection days, services offered, billing practices or recycling performance. In September of 2004, the County Board of Supervisors passed a law changing the unincorporated portion of the County to a franchise trash hauling system. With this new law, in order to collect residential trash, a hauler must now be franchised by the County and all non franchise haulers will be barred from this business. To date, the County has franchised haulers in thirteen different communities in LA County and is about to do so in Altadena. When a franchise is established, a detailed contract is awarded, a hauler is selected by the County through a bidding process and the County oversees the performance of that hauler. Typically the contract period is seven years. About two years ago, the County sent out a questionnaire to residents of Altadena asking such things as how many trash cans they used, what kind of trash is offered for collection, and how many haulers the residents wanted. This questionnaire was a small yellow post card. Do you remember getting it? Most people don’t. It could easily have been mistaken for junk mail and it gave little explanation of what the issues really were. Then, about two months ago, the County was about to request bids on the contract for Altadena that would define our trash hauling for the next seven years. Several of us on Council were concerned that the community input on this was inadequate, so we stopped the process to allow us to review the contract and to gather more input from the residents. Thus, we are now asking for your input on the two important issues that we can affect at this point; what should be in the service provisions of the contract and should we have a single hauler or two haulers. Whoever is the franchise hauler or haulers will operate under a single contract that is offered by the County. That contract will spell out such things as the scope of services i.e. the number, type and amount of pick ups, the type of containers, the provisions for price increases, the recycling requirements, and the conditions under which the contract can be terminated. While many of the contract provisions are fairly standard for all communities, it is important that the scope of services of our contract meet the needs of Altadena. This is the area of the contract that will most influence our weekly interface with the hauler. [Below] is a schedule of the service provisions of the contract. Council has worked with the Department of Public Works to beef up several areas, especially the collection of green waste since we have large, leafy lots in Altadena. However, we are still looking for input from you to help us decide on what is best for most residents. This may be the most controversial and confusing issue. When the County sent out its post card survey, it asked if residents wanted an exclusive, semi exclusive or multi hauler program. The majority or respondents requested semi exclusive or two haulers. However, there was no explanation of what this really meant. Most of us thought that having two haulers would, through the mechanism of competition, give us more options, better service and lower prices. However, this may not be the case. The contract will be the same for a single hauler or two haulers so there will be no differences in the services provided. And as for price, the competition will come at the front end of the process when the haulers bid for the contract. In fact, experience has indicated that a lower price is attained when the provider has a larger customer guarantee, since among other factors, there is a capital outlay required to service the area. As for the weekly performance by the providers, the County will oversee the compliance with the contract for one or two haulers. Of the thirteen contracts already awarded by the County, all have been exclusive contracts. The average price for service has been around 10% less that the previous price of the open market, with generally more services provided. The County reports that the customer satisfaction has been high with few resident complaints to date. More bidders for the contract thus lower prices. Reduced pollution and road wear. We need your input on the scope of services provided in the contract, in particular green waste pick up. We would also like your thoughts on the single provider approach. Town Council will debate and recommend contract conditions at the December 16th meeting. The County will then make a request for bids to the industry, select the winner based on a formula that includes price, financial capacity, past history etc. Depending on the winner, as determined by the County, implementation could be from 3 to 6 months. Of course we don’t know. It is expected that both allied and Athens will bid for the Altadena franchise. However, I find it most interesting that of the thirteen franchises awarded so far, those two large haulers were only awarded three. Most of the franchises were awarded to medium sized haulers. The feedback from those managing the bidding process is that those medium sized haulers are more likely to bid on an exclusive franchise than if a semi exclusive franchise is offered. If you have input to give Town Council please contact you Census Tract Representative. The contact information is on the Town Council web site. As an alternative you may want to come to our next meeting at the Community Center starting at 7:00 p.m. on December 16th. Regular pick up service Weekly between 6:00a.m.and 6:00p.m. No charge for Seniors or the disabled whoare the head of the household . These pictures came in at about 9pm tonight via the ACT email loop. I put a Google Map below with a pin at the approximate location described in the email. From: Richard W: "These pictures were taken from the end of our driveway, looking NE. The ridge where I spoted the lion is maybe 200' and just accross a small canyon from the end of our driveway. Whew!" Bonnie R added in the thread that it is "an adult mountain lion hanging out on the ridge between the ends of Coate Court and Sunset Ridge Road today around 1:50. It appeared to wander down the hill toward the top of Sunset Ridge or in the canyon behind the houses." Last night around midnight, I noticed an unexpected spattering of rain drops. It was not enough to register as rain on the gauge, but it would certainly have made drivers switch on their wipers. This morning, we were greeted with amazing rainbow weather. I took this photo (click to see full size) and video (below) before leaving to drop off the kids. I wish I had taken my camera along, because there were plenty more gorgeous rainbow vistas along the way. By 8:30 enough rain had fallen to moisten the sage, and there was that wonderful fresh desert rain smell in the air. We got a decent shower, in and out, over the course of the morning. So far we have accumulated the first 1mm (.o4") of the season. Listen carefully for the first inklings of distant thunder in the beginning of the video below (taken around 7:15am). At a bit past noon, we had a great peal of thunder, rolling along the hills from west to east, and lasting for much longer than normal; perhaps 10 seconds or longer. By now the sun has come back out, and it feels like LA summer again. Believe it or not, this is the first time an earthquake has occurred since I've lived in CA (since 1998) where the building I was in noticeably shook. It was nothing major, but definitely rocked the office here on Stonehill Drive, and the open door kind of waved gently. Nothing fell off the shelves, and my sleeping dog only lifted her head groggily to see what was waking her up. She only stood up after the shaking stopped to follow me outside. It's hard to judge time after the fact, but I think it only shook for 5 seconds or so. "A moderate earthquake occurred at 11:42:15 AM (PDT) on Tuesday, July 29, 2008. 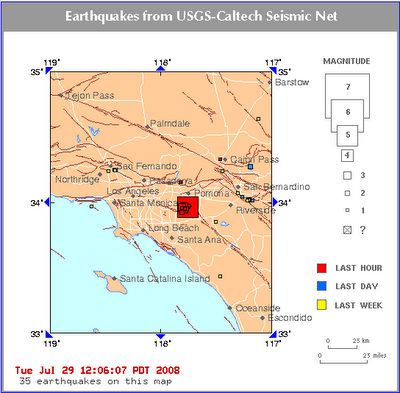 The magnitude 5.8 event occurred 7 km (4 miles) SE of Diamond Bar, CA." 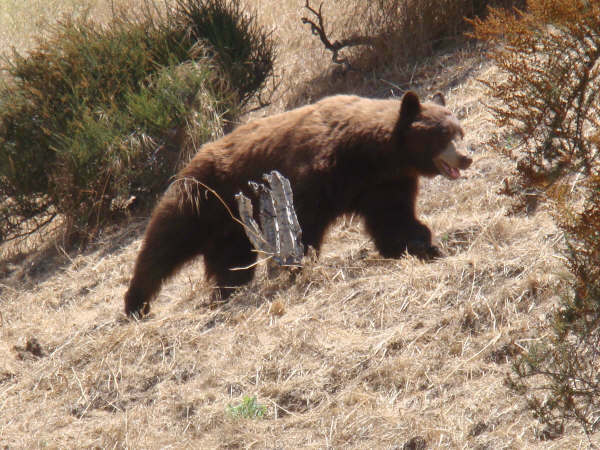 Sameer E photographed this bear on 6/28/2008 at around noon time. He recently posted the picture in response to Brian L's sighting reported on the ACT email list. Here's what Brian reported yesterday: "I was driving home tonight (Saturday 7/26/2008) at about 8:30 PM and was entertained by a bear roaming around on the road by the bridge over the wash at Rubio Canyon for a good minute or so. This guy looked pretty good sized to me." Upon seeing Brian's and Sameer's reports, neighbor Sidarth D posted this on the SHN email list: "Yesterday, we had a bear in our driveway for the first time. We had left our garbage can outside unfortunately by mistake, and it was rummaging through the garbage can. Our daughter took these shots. I don’t know if this is the same bear that was seen in the Rubio Canyon bridge, but it could be as we are quite close to that." (I think this sighting was on Zane Grey). Marianne W also reported a sighting: "We had a sighting on Tanoble and Loma Alta on Friday night at about 9 or 9:30 p.m. It was going south on Tanoble, and then headed up the hill in between houses up to Skyview. A news truck was also driving around trying to get pictures. We notified the Sheriff station." Friday night on Stonehill Drive we had a family of raccoons in the back yard (a mother and four juveniles), and Saturday morning we were a bit stumped at how they had managed to tip over the huge Allied Waste container. Perhaps the tipped can was actually the bear. Whatever tipped our can must have been unimpressed with what was in our can, because the kitchen bag was torn open, but it was left neatly on the lid of the can, and no trash was strewn around. Below is Doris F's contribution to the bear sightings: "Well, actually it was the bear's contribution, and it was quite a while back. 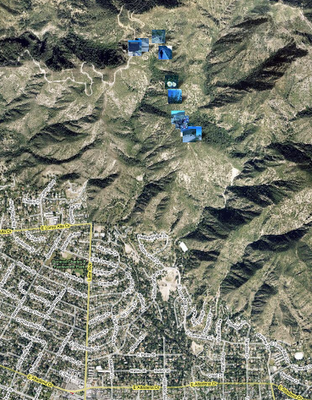 However, within the last week, a bear was seen where Loma Alta terminates at Pinecrest, so it is probably the same one. Also, within the last month or so, two mountain lions were seen in Eaton Canyon. 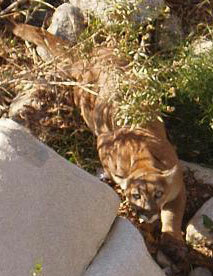 They were spotted by at least one family who lives on the rim off Altadena Dr. by Crescent." It's unclear if this is the one bear, but it's clear that there are one or more bears living in the neighborhood. Keep the photos coming if you can get them safely. Most importantly, be safe. Don't approach wild animals, especially not just to try to get a photo. Greg Garner forwarded me these awesome bear pics taken on Saturday 6/28/2007. Thanks Greg! "Meet at the north end of Lake Ave. in Altadena at 7:30 AM. After arriving at the Cape of Good Hope there will be a one-mile hike down the railway grade to Echo Mountain. Seeing remnants of the Echo Mountain House and Chalet Hotels, the power plants, tennis courts, observatory, Zoo, Section House, Cable House and Incline. See ongoing work performed by the volunteer groups. There will be a limited number of visitors. We will be behind a locked gate and those attending will be required to stay with the group from 8:00 AM to 1:00PM." Not knowing exactly where the Cape of Good Hope was, the part that caught my eye was, "we will be behind a locked gate." So I packed a picnic of nuts and water along with my digital camera, and set my alarm for Saturday morning. We congregated at the top of Lake, and at 8am, we set off with about 15 or 20 people in a caravan of 5 cars. We drove to the top of Chaney Trail and were given special access to drive passed the locked gate at the Mt. Lowe Road. We drove east up a slight grade for about two miles, and stopped at a small dirt parking lot located roughly along the historic rail bed at a point known as the Cape of Good hope. 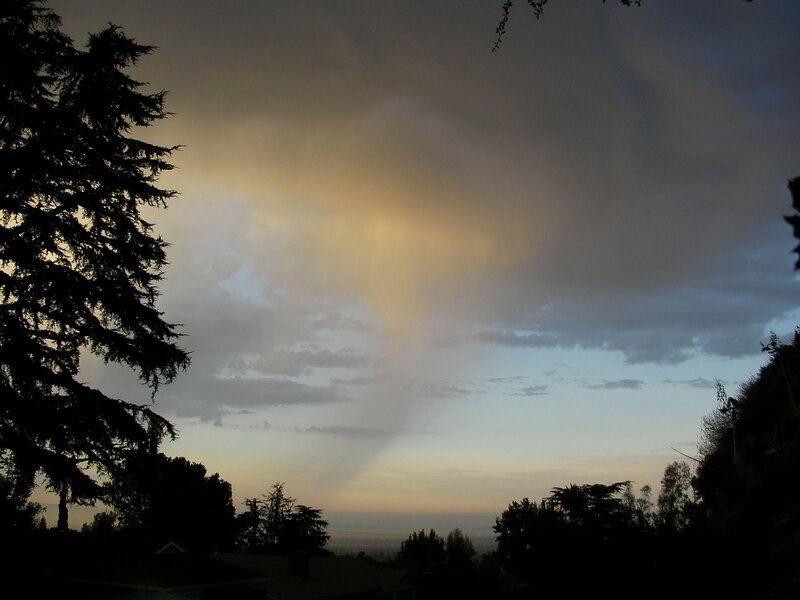 A brief hail "storm" hit Altadena, CA on Saturday, March 15th, 2008. This little March event was NOTHING compared to the October 17, 2005 hail storm we had. Here are the two posts with links to video of that one. Old Wamu on Lake Burns: Time to Renovate Ralphs? Please click on the links under each question to cast your vote, then click View the results to see what others are saying. Would you be in favor of Ralphs renovating their Altadena branch? Would you support Ralphs if they wanted to expand onto the old Washington Mutual property which burned down on 2/28/2008? A little background. As many in this area will recall, about two or three years ago, BFI was bought out by Allied Waste Services. When it was still BFI, Athens Services came to town , offering a cheaper alternative, but rather than switch, I called up BFI and told them I had a lower offer. BFI promptly matched Athens' rate without argument. Ever since Allied Waste took over, they have been trying to sneak up my rate, but each time I have called and told them that Athens is cheaper, and they have (now grudgingly) acquiesced and matched Athens rate. As far as I know, we still have no power this morning (I'm in a Starbucks). According to Steve Gerow, the Edison message from last night estimated power being restored by noon today. My rough estimate from a walk last night is that the blackout area was all of Loma Alta east of Sunny Oaks and all the side streets off Loma Alta along the same stretch. Zane Gray and Rubio Crest were lit up as if nothing happened. I didn't walk around the bend towards Noyes, so I don't know how far east it really stretched. A few of us saw a truck driving around last night with a spot light, presumably looking for downed lines. 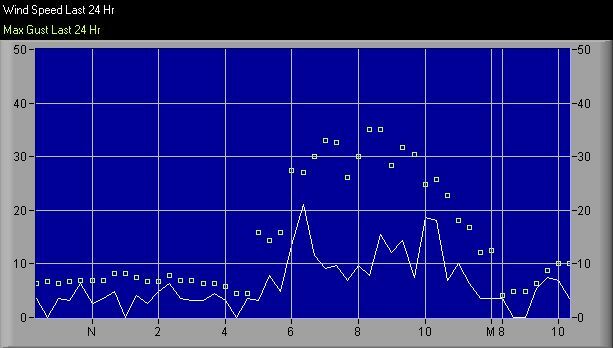 My weather station computer stayed on battery power until about midnight. The image above is the last one it uploaded before the network went down. This amazing shot of a mountain lion was posted on the ACT mailing list this morning with a caption reading in part, "Photo taken by JPL employee Wednesday,1-16-08, looking down into the Arroyo Seco from the bridge from the JPL east parking lot to the JPL campus."